Chamela is the first real anchorage south of Banderas Bay. There is one noted stopover just a few miles south of Cabo Corrientes, Inpala Cove. Guide books say marginal protection and room for only a handful of boats. 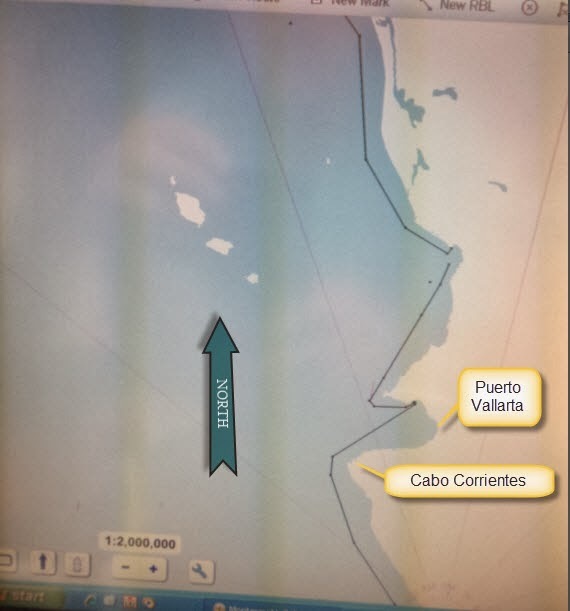 Planning our trip around Cabo Corrientes (Known as the “Point Conception” of the Gold Coast) requires passage early in the morning to minimize the interaction of the wind and waves brought about by this abrupt change in the coastline. Since we will pass Inpala early on our journey and mid morning we will not risk stopping since we don’t anticipate needing rest. To shorten the early morning activity and as a courtesy to our marina neighbors we anchored out at La Cruz the night before our trip. It takes about half the time to get underway from anchor as compared to the dock with no shore cord, lines, fenders etc to store and we are a few hundred yards into our trip. Also gives a chance to run the boat after time in the slip and check for any issues that might delay the trip. We are traveling with Salacia, a N40 Captained by Neil and Dianna who we met on the FUBAR trip south. The N40 is about a ¾ to a full knot slower than us at cruise. Does not sound like much but 6.5 kts vs. 7.5 kts over a 100 mile run is 12-15 miles separation on arrival if we start together. For WORKNOT its easy to slow down to 7 kts and save about 20% in fuel burn. In good seas we don’t mind the slower pace. In heavy seas we likely would need to slow but then so would Salacia. Planned departure was 4 AM but Mary and I both were anxious to get to sea and we caught a glimpse of Salacia underway at 3 AM. By 3:30 AM we were also underway. We do lots of sunset pictures but the sunrise can also be spectacular. This is just south of Cabo Corrientes. Cabo Corrientes lived up to its reputation, arriving just at sun up we were greeted by confused seas and winds in the low 20 knot range. Lumpy but not uncomfortable and not dangerous. Just a gentle reminder we are at sea and we really are ALL in small boats. After clearing the point by 5 miles we turned south and the seas were quickly on our stern quarter. 4-6 miles further south things smoothed out, winds dropped to under 10 kts. Clear and warm, we saw plenty of dolphins and a few birds working bait fish. Dolphins like to play in the bow wave and we had more than a dozen from time to time splashing along and crisscrossing in front of our bow. I was off watch and sleeping in the pilot house watch berth at 2:15pm while Mary had the helm. WORKNOT was following the course laid out on our plotter directly coupled to the autopilot. We are gaining experience with this tool and still on the learning curve. This system will take us waypoint by waypoint along a course, asking to turn at each waypoint and keeping the boat on track within 50 feet in settled conditions and rarely more than 200 feet of the ideal course in heavy weather. If you want to modify the course while underway it’s a little complicated and not overly intuitive. Mary needed to move a waypoint away from shore to improve our course and in the process reversed the course. WORKNOT dutifully turned 180 degrees, directly into the wind and oncoming seas. The change in motion along with spray on the windshield woke me from a deep sleep in a panic. A quick scan on the radar confirmed we were not near land, in deep water but it took me few moments to figure out what was happening. Salacia called to see if we were fishing or just lost our minds or at least sense of direction. Mary fessed up to autopilot mis-management and we had something for the log book. We quickly returned to our steady course but sleeping for me was over. Fishing was slow, we caught a single Bonita but we remain hopeful for a repeat of our success on the FUBAR. The freezer is getting low and we will keep fishing in hopes of tuna or Mahi Mahi. Arrived in Chamela at 5:20 PM. Rocky point to the north and two rocky islands to the south. We woke to find this Mexican Navy boat anchored near our stern. Comforting to know the are “out there” if needed. Our trip ashore with Neil and Dianna was short as a tour of the “town” took about an hour. The town has a motel, beach hotel, trailer park (actuall called “The Trailer Park”). Looks like a great place to hide out. Several small tiendas, (small family run grocery stores) and a few clothing shops. Not much else other than half a dozen palapa and beach side resturants. The school is the largest building in the town. Farther south there are several exclusive private resorts and some very large homes on the waterfront. A real estate trailer is set up with lots available for building and development. In the US this view would be priceless, here about $100k US asking price. We took a dinghy ride around the bay, about 4 miles long with two major islands and many smaller rocky outcroppings. A few additional anchorages are available but they are small and unprotected from swell wrapping around the point. Neil, Dianna and Chewy, Keela’s new best friend. Mary and I went to town early in search of some supplies and to take Keela for a walk. Just as we returned to the beach a panga landed and they were off loading fish. In very poor Spanglish, we convinced them to sell us one of the fish. As usual, a teen ager came along who spoke English and saved us. The kids seem to all have some English capability. Maybe its U-Tube or the net. $200 pesos /$15 US we bought a Red Snapper. Not sure what we had until after the transaction but we quickly decided the price was right for about 3.5 kilos / 7.5 lbs. of fish. Mary pan seared it and made a great dinner for 4 of us.